Roboforex is a forex broker that came under the flash light very abruptly, and gained customers satisfaction. Roboforex is regulated by CySEC, IFSC, and official member of ICF and IFC. It is registered with the UK FCA, and also registered as a legal investment company in 29 European countries. The business address of Roboforex is Soboh House 377, 28th October Street, office #1, CY-3107 Limassol, Cyprus, and the legal address of Roboforex is 4 Modestou Panteli, office 005, Mesa Geitonia, PC 4003, Limassol, Cyprus. Before focusing on the features of Roboforex services, let's surf on the internet to know what traders with Roboforex experienced while dealing. Following are some of positive and negative comments by traders about Roboforex. 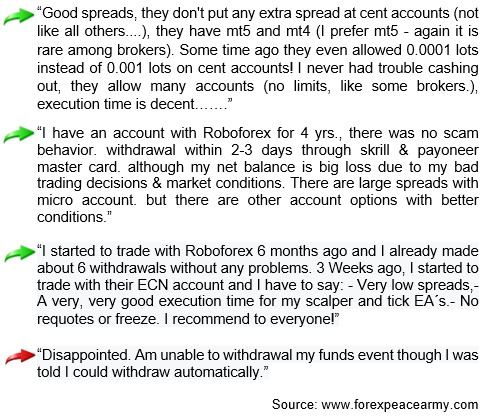 On internet there are small number of negative comments about Roboforex exist, but these are very common. So far Roboforex providing services very smoothly. Following are some of the key features traders can consider before opening an account with Roboforex. 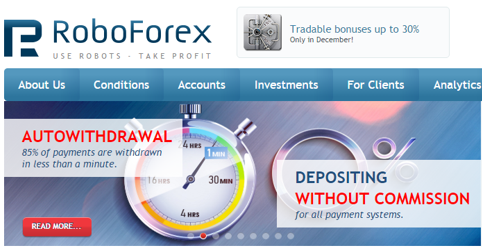 Why traders may open an account with Roboforex? It is an award winning forex broker. It has won so many awards in the forex industry e.g Fastest Growing Forex Brand Asia in 2014, Best Standard Forex Broker in 2014, Best Forex News & Analysis Provider in 2013, Best Retail Forex Brand Russia & CIS in 2013, Best Retail Forex Broker in 2013, Exchanges & Brokers Awards in 2013 - Best Execution Broker in Eastern Europe, Fastest Growing ECN Broker Eastern Europe in 2012. It is a regulated forex broker. It offers low spread commonly near one pips. It has multiple trading accounts e.g. ECN Fix Spread NDD, Fix-Standard, Pro-Standard, Fix-Cent and Demo Accounts. It offers no-dealing desk forex trading. It has so many trading platforms e.g. MetaTrader4, MetaTrader5, WebTrader, Multi-terminal, cTrader, cTrdaer Web and mobile platforms. It has a huge number of deposit and withdrawal options. It offers up to 115% deposit bonus. It offers social trading named copyFx system. It has 24/7 customers support department. It offers swap free Islamic account. It delivers real time analysis. It has Autochartist signal service that provide trading signals, and they are available for free for the traders with Roboforex. Why traders may not open an account with Roboforex? Roboforex is not regulated by one of the top regulatory bodies like CFTC. In bottom line, Roboforex has been serving customers very well so far. Some traders made some negative comments on some websites, but majority of the traders dropped positive comment about Roboforex. From my study, I am going to conclude that Roboforex is not a SCAM forex broker. If you have any good or bad experience with Roboforex, you can drop it below. Your comments will surely help other traders to find a good broker. You can subscribe to yourFXguide to receive updates right into your inbox.